TALLAHASSEE, Fla. – For the second consecutive game, the Clemson Tigers (12-5, 3-1) emerge victorious over a ranked opponent, downing No. 22/18 Florida State (14-2, 2-1), 57-45, Sunday afternoon at the Donald L. Tucker Center. Sunday’s win marks the first time in program history that Clemson has defeated back-to-back ranked opponents on the road. The Tigers benefited from a solid bench performance and an overall imposing defensive showing en route to starting conference play at 3-1 or better for the first time in 21 years. Outscoring Florida State 21-10 in bench points, Clemson overcame a slow start that saw them trailing 13-10 through one quarter to control the game for the rest of the way. Shooting 41 percent from the field, the Tigers made the most of their opportunities down low, tabbing 32 points in the paint. Clemson's defensive pressure set the tone in the contest with Florida State committing 23 turnovers, opportunities that the Tigers capitalized on with 20 points off turnovers. Coming up with her 14th career double-double, Clemson forward Kobi Thornton led all scorers with 19 points on 9-of-17 shooting to go along with her 10 rebounds. As the X-factor for the Tigers, senior Aliyah Collier produced a superb veteran performance, making an impact on both ends of the floor. 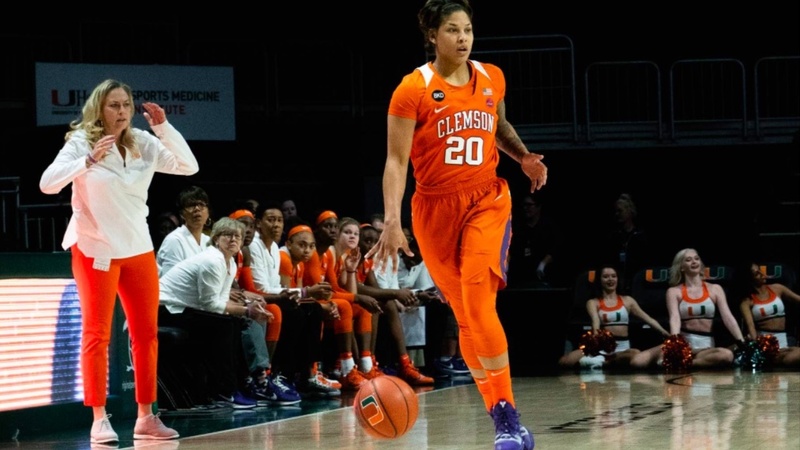 With 11 points and six rebounds, Collier came down with multiple hard-fought boards and, along with fellow guard Keniece Purvis, made a significant difference off the bench for the Tigers. It was a game of runs as the Tigers used a pair of lengthy runs to close out both halves of the game. A 14-2 run by Clemson over the final 6:24 of the first half resulted in the Tigers sporting a 31-26 advantage at halftime. Led by Thornton, who notched 12 points on 6-of-10 shooting in the first half, Clemson used offensive efficiency to take a healthy lead into the locker room. Trailing by eight points entering the fourth quarter, Florida State went on a 6-0 to pull to within one in a strong comeback attempt. However, Thornton put a halt to the Seminoles’ momentum with a critical jumper. Trading baskets through the middle third of the final quarter, Thornton kicked off another Tiger run, an 11-0 spurt, to close out the 12-point triumph for the Tigers. Boasting a three-game win streak in conference action, Clemson look carry momentum into Littlejohn Coliseum when it takes on the Georgia Tech Yellow Jackets (12-4, 2-1) on Thursday, Jan. 17. The conference matchup is scheduled to start at 7 p.m. and will be broadcast on ACC Network Extra. Junior Kobi Thornton tallied her 14th career double-double with 19 points and 10 rebounds in the game...The Tigers shot 40.7 percent from the field, their 11th game with a shooting percentage of 40 percent or better this season...Clemson is now 25-30 all-time against the Seminoles and 12-16 when playing in Tallahassee...The Tigers have not started the conference slate with a 3-1 record (or better) since the 1997-98 season when Clemson went 4-0 to open conference play...This is Clemson’s first win over Florida State since March 1, 2008, a 72-70 victory in Tallahassee...Clemson has not defeated back-to-back ranked opponents since 2000 (wins over #12 North Carolina and #3 NC State)...The Tigers have never defeated back-to-back ranked opponents on the road (true road games).